The night started with an air of excitement wafting through the room. This concert was sold-out; everyone was pumped-up, and eager for the show to begin. The opening band is often new to the scene and unfamiliar to the audience. That was not the case on this night. Instead of people filtering in through the course of the first set, the room was packed to the walls right from the start: they had also come to see St. Lucia. Everyone seemed to know the lyrics and sang along with the band. St. Lucia is actually the stage name for the lead singer, Jean-Philip Grobler. Grobler started his band St. Lucia just a couple years ago, but already they have a very strong following. Their debut album, When the Night, produced by Neon Gold/Columbia Records, was released just last year. This band sounds very distinctly synth-pop, but there are also non-electronic instruments that color the beats in their music. The energy this band put out was infectious. Whether this was the first time you heard their music, or the hundredth time, you were moving your feet to their tunes. Towards the end of their set, they asked everyone to raise their hands in the air as one of the band members took a selfie with the audience waving behind him. It was a great way to end their set. This crowd may not have only been in love with just Foster’s sound. All the guys in this band look like they’d stepped off the pages of GQ. They had many adoring eyes in the audience watching them. 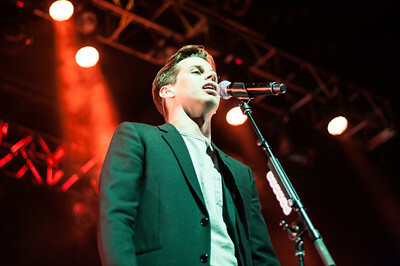 Mark Foster, lead singer and band founder, definitely impressed, not only with his vocal range but also his skill, jumping from guitar, to solo acoustic, to assisting on keyboards. Actually, several of the guys seemed to jump from one instrument to another during many of the songs. This band not only has skilled musicians, these guys are real performers and they obviously have fun jamming on stage. They were constantly moving: not only playing their instruments, but jumping, dancing, and obviously enjoying their own beats. The fantastic light show going on around them also added to the fun and excitement. We loved every minute of it!